Hello there! If you are new here, you might want to subscribe to the RSS feed. Would love to keep you in the loop! Editor’s Note: Be sure to check out a newer post that includes solutions for both fans and page admins by clicking here. And by “new” I mean [fill in your favorite expletive]. If you feel Facebook needs to roll back this pay-to-post change, please click the Facebook share button below. If enough users push back, there’s at least a slim chance they’ll reconsider, having done so on similar initiatives in the past. I wish your suggestion would work – but, unfortunately, it’s just the inverse of the “hide all by” option next to any given news item. The default is “show,” which is good, and which you can confirm by poking around some of the pages you’ve previously “liked”; but, as you point out, only a small percentage of posts are in fact being shown. Note that it doesn’t say “show all by”! If I find a free/reliable workaround, will comment again, but I’m not holding my breath. I’m a little confused. I have checked many of the pages that I like and “Show in News Feed” is checked on all of them. Does your tip mean that we should be checking the ones that are not checked, or that the simple act of viewing this status is enough to trigger a change? So frustrating! I also noticed that just before Facebook went “public” my ad cost skyrocketed – suddenly my ad got hits where 3 months up to the sudden clicks there was nothing. I had almost forgottent that I even had an ad with them! I find it even more disconcerting that when I DID try to share this on my company’s page, the FB servers stopped responding. But my browser loads any other FB-related post I try to load. Am I getting conspiracy theorist-y now? You have to admit, it’s pretty creepy. Editor’s Note: I’ve been seeing lots of mis-loaded pages, hanging pages, etc. the past week. There was a major FB server outage early last week; makes me wonder if they’re still having troubles. This explains a lot. I wondered why our page said only 268 people had seen the posts when we have over 1500 fans. I guess this explains it. $*@& you, FB! Too bad you can’t get customers to do this. The best thing you can do is get them to engage with you. Hasn’t FB made enough billions? This is rediculous to the majority of its users. Another way to encourage fans to be able to “see” your posts is to have them make a list for your page or pages like yours. They will see more posts that way. Hmmm…will play with that a bit to see if it helps. At this point, all options need to be used. Thanks for the tip, Philip. Is there any reason to believe that adding a page to a list increases the number of posts that appear in the normal newsfeed? As best I can tell, all “Add to list” does is put page posts into a folder in the left column on the newsfeed page—not actually increase the visibility in the newsfeed itself. So how do we as fan page owners make sure that more fans see our posts without paying facebooks promote fees? I understand that fans can change their settings, but is there anything we can do? the algorithm giveth, and it taketh away. AllFacebook reported back in January that the average page is seen by less than 20% of fans (http://allfacebook.com/facebook-page-17_b73948). complaints about edgerank go back to the dawn of fan pages. so now Facebook is providing a way to throw money at the problem – gosh, like a real media company! if you want to buy views the old-fashioned way, make your posts consistently interesting. if your fans that do see the post comment on, then the post will be shown to more fans. Mashable published a nice piece on post timing last fall (http://mashable.com/2011/10/26/time-facebook-posts/), but caution to the whiners – it takes some basic analytics chops and again, content that’s worth seeing. I ran an experiment last week when the Promote option first appeared. I took a post that was 24 hours old and paid to have it promoted. At the time I started the campaign it was 24 hours old and 288 fans had seen it. FB estimated they would reach an additional 1,000 fans for $5.00 so that’s what I opted for and gave them my CC. Well 48 hours later, at the end of the Promote Campaign Apple reached exactly 198 fans. That’s all… 198 fans for which they charged my CC $4.95. Truth in advertising? I think not. Will we be paying for Promoted Posts? I think not. I have shared our findings with our FB fans and they don’t like that they are not being shown pages they fully asked to be shown on their wall. I think this will blow up and back into FB’s face. Noooooo. Facebook is – and always was – supposed to be the magical tool for making Mark Zuckerberg basquillions of dollars. Still seems to be working fine. Has anyone seen an official explanation from Facebook on this? I’d love to see how they explain it. So much for using Facebook to cheaply promote my site! Editor’s Note: I stand by every word in the post. No assurance was made that selecting “Show in Newsfeed” is a guaranteed fix—just that it might help increase the odds of posts appearing for pages you like. So if I share this with the “share” button to my FB page, will I be in violation of their rules? I didn’t quite understand what you meant about the Pinning thing instead? eek! Editor’s Note: No, you won’t be in violation; “social sharing” is the backbone of Facebook’s success. You’re safe. 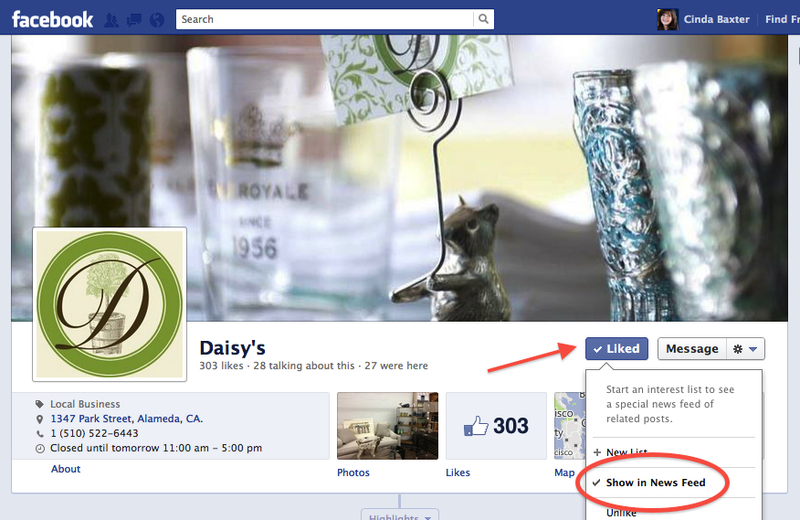 The note about pinning and cover photos refers to FB’s rules about not putting a call to action in either place. In other words, you can’t show a cover photo that says “Please like us” because it’s instructing readers to do something. How could you not even mention EdgeRank in this post? Editors Note: The post is about what’s happening, and how to work around it—not the technology used to run the algorithms. create engaging content that people want to see and share… there’s been too many scammers and spammers on FB. Content rules the day and the future for that matter. It was just a matter of time before Facebook stopped being cool and started being greedy. The entire reason I pay for Facebook advertising is to build our fan base, thereby giving us a ready audience for posting info about products, sales, etc. Facebook should be sued for misleading businesses and others who already pay for advertising. It was never made clear to those who purchase advertising that the majority of those fans we’ve PAID to obtain are never going to see our posts! NO CLEAN SINGING » DID FACEBOOK JUST MAKE A HARD LIFE HARDER FOR UNDERGROUND BANDS? FB Followers may be missing our updates! ODMcomic.com - Contest Update! !…and some Facebook hate. Engaging your Audience: Does Facebook Fail? Previous post: Adobe Creative Suite: To Cloud or not to Cloud?